Aluminum Skin on two sides of a recycled thermoplastic core. 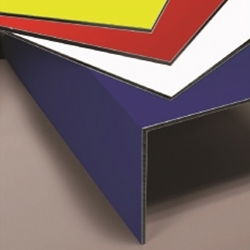 PolyMetal™ sign panels are comprised of a recycled thermoplastic core sandwiched between two sheets of finished aluminum on one or two sides. The recycled thermoplastic core lends itself to resisting moisture. PolyMetal™ panels also feature the ability to digitally print direct to the panel, thereby allowing for complete design flexibility.